Finding Spring | What is ML Reading? With eight out of the past ten school days cancelled due to inclement weather, it’s been an exhausting two weeks. Even the kids are happy to be back in school. When I entered the living room this morning, ML had her pink backpack strapped to her back. Sitting on the sofa waiting for 8 am. 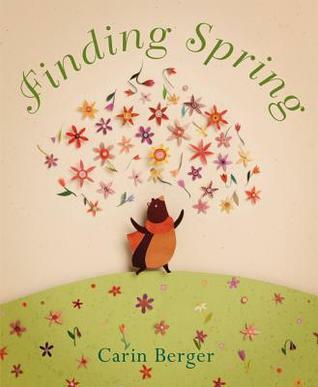 Last night, we read Finding Spring by Carin Berger. A few pages in ML shouted “collage.” At the end she called it a “lovely book.” It’s both of these things. It’s hard to imagine the time and skill required to cut each snowflake and delicate flower. We know we’re getting close to Spring. The Robins have returned, our first daffodil bloomed, and bluebirds are building a nest in our house. We just need to make it past Thursday. Temperatures close to 70 on Wednesday and a wintry mix forecast for Thursday. I won’t feel completely safe from winter weather until after March, 12th. That’s when the Blizzard of 93 hit north Georgia and Berry College students were stranded with no power and little food. Except me, a family reunion sent me home for the weekend. Our power never went off, the ACC basketball tournament was on and the fresh green beans and Honeybaked ham for the family reunion provided sustenance for our family. As for the ACC tournament, I relished Georgia Tech beating Chapel Hill. Little did I know in a few years I would be a Tarheel.